There’s nothing store-bought that I’ve come across that matches homemade granola. It’s crazy to think of spending 4-5 times the cost of the ingredients to make an inferior product. Especially when making your own is a cinch. 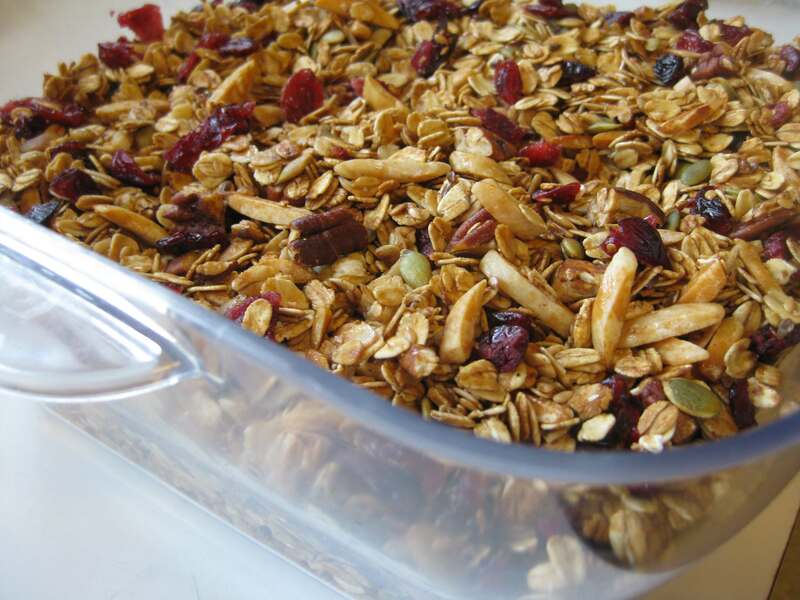 Granola comes in all kinds of assortments, a veritable kitchen sink of ingredients. 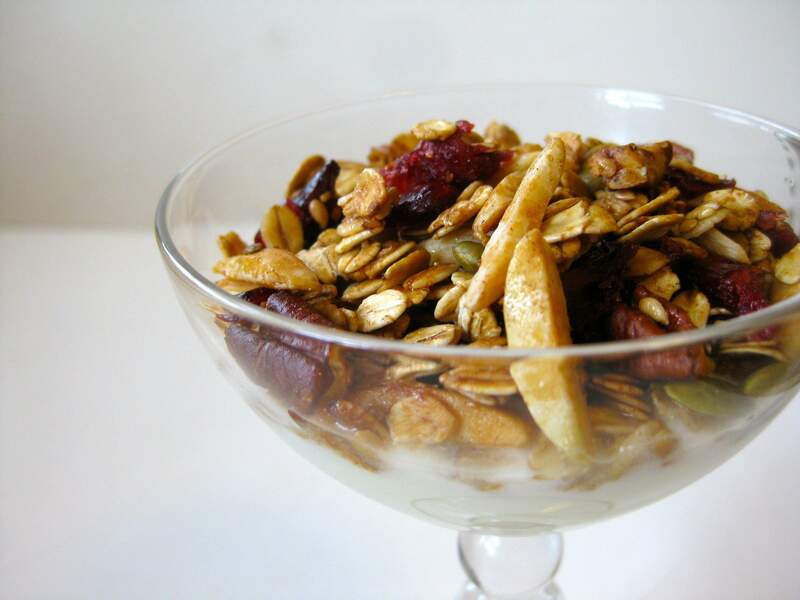 Rolled oats (organic preferably) constitute the base and to that you add nuts and seeds. With the addition of a sweetener such as honey or maple syrup (and a little vegetable oil to help the browning process), the mixture is baked in the oven. Dried fruits, if you’re using them, are added after the cooked grain mixture has cooled. For the upcoming Thanksgiving and Christmas holidays, I used seasonally compatible ingredients: pecans, pumpkin seeds, cinnamon and dried cranberries. I happen to like flax seeds, but sesame seeds work well too. Sprinkled on yogurt (oh yes, you can make that too), this makes a great and nutritious breakfast. I typically halve this recipe but with family and friends around for Thanksgiving, I might need to make a second batch! Preheat oven to 300 degrees. Mix the dry ingredients together in a large bowl. Lightly warm the honey and oil together in a saucepan and pour the liquid over the oat mixture, stirring to distribute it. Spread in two large baking pans and bake for about 30 minutes, stirring frequently, until brown. Cool in pan, add the dried cranberries, and store in a tightly covered container.